It’s a fact: more data is added via the Internet every second than the Internet had in its entirety twenty years ago. This accumulation of “Big Data” comes from many sources, including consumer and business files — including photos and images, spreadsheets, mobile application data, and more. In the past, much of this data was stored in the memory of computers and mobile devices. Now, data is increasingly being stored “in the Cloud,” which allows it to be accessed from anywhere with an Internet connection, and numerous companies are battling it out for this market. Let’s look at the numbers behind cloud storage, and particular for two hot companies in this market, Box and Dropbox — both of whom received additional funding in Jan 2014. The “Cloud” is a generic term which collectively refers to a number of online services that make it possible to do computing remotely (aka Cloud Computing). Cloud storage is the component of Cloud Computing which allows for data to be saved and accessed remotely. Hard drives and flash drives are still used, just as for any computer or mobile device. Cloud storage is specifically designed for remote use via the Internet. Accessibility is the key feature of Cloud storage. You are not tied to a desk in order to access data entered on a computer. Data can be created from one device (e.g., desktop or laptop) and accessed from another (e.g., smartphone or tablet)– with Cloud storage being the glue. Data can be shared collaboratively, thus allowing for remote work. Cloud storage helps reduce (but does not necessarily eliminate) duplicity of files. Data can be accessed and crunched remotely, just as if it were on your computer’s hard drive or mobile device’s flash drive. Cloud storage is particularly important to enable the IoT (Internet of Things) to function as it should. The IoT is a broader Internet of all sorts of “things” — electronic or organic — that are networked and can which generate data that needs to be accessed remotely. For example, bees, cows and other creatures with networked electronic chips with one or more environmental or physical sensors are part of the IoT. So are home automation devices, such as smart thermostats that can be accessed from a mobile app. In short, Cloud storage is a fundamental component of Cloud Computing. Ultimately, it changes the way we live and work. It can allow for the storage and access of data from a multitude of devices — computers, smartphones, tablets, smart cameras, smart watches, Internet-connected sensors and hubs and more. In other words, potentially any net-connected device that has the ability to host 3rd party apps with Cloud storage access. What Can Be Saved in the Cloud? Personal and business data generated from applications from Web or mobile apps. Pictures, illustrations, screen snapshots, etc. Documents: text, word processor, PDF, etc. You get the idea… anything digital. Are There Any Security Issues in Using Cloud Storage? Security issues for Cloud storage are pretty much the same as security issues for any Internet-based services. There are security measures but they can potentially be circumvented. How Big is the Cloud Storage Market? Consumers use Cloud storage without even knowing it. Do you have a Google GMail account? All that extra free storage they give you is Cloud storage. That means that in an ever more online-connected world for work and play and life in general, the Cloud storage market is huge and growing. $300B is the estimated size of the entire Enterprise software market — of which Cloud storage is a part — according to a tweet by Aaron Levi, co-founder of Box. $40B was the entire Cloud Computing market in 2011, and estimated at $150B for 2013. $8.64B (90%) is the amount Microsoft announced in Apr 2011 that they were spending from their $9.6B R&D budget towards Cloud Computing in general. $5.6B was the market in 2012 for just global private Cloud storage market. $46.8B is the expected value of the global public and private Cloud storage market by 2018. This is a yearly growth rate (CAGR = Compound Annual Growth Rate) of just over 40% (40.2%) per year from 2012-2018. North America has 60% of the Cloud storage market, which will go from $3.4B in 2012 to an expected $21.8B by 2018 — a 33.8% CAGR for 2013-2018. IBM announced in early 2014 that they will invest $1.2B to Cloud storage services for SMBs (Small- and Medium-sized Businesses), in a partnership with Actifio. Actifio is targeting a $44B market. With IBM, they’re targeting a $100B market for Cloud expenditures. Cloud hosting providers are expected to each have an average of 8 Zettabytes (ZB) of data stored by 2015, up from 2.7 ZB. Here’s a breakdown of data storage size measurements. So if you have a hard drive or flash drive with 1 TB of space on it, it would take a billion of them to make room for 1 Zettabyte of data. 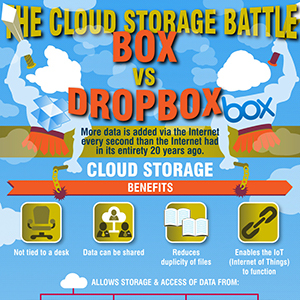 How Do Box and Dropbox Factor Into the Cloud Storage Market? Both companies offer Web and mobile apps to manage files. Custom Web and mobile apps can use APIs (Application Programmer Interfaces) to manage files. The competition in Cloud storage is fierce enough that Box upped the proverbial ante in Jan 2014 by giving away 50 GB (GigaBytes) of storage space to accounts that used their then new iOS 7 app for Apple mobile devices (iPhone, iPod Touch, iPad). While this promotion was to be for a limited time, this is compared to Dropbox’s measly free 2GB of space. Dropbox accounts are upgradeable to a maximum 8GB free if you entice people via email to join, or share the offer on social media channels. Here are some facts and figures about both companies. Dropbox co-founder/ CEO Drew Houston is now a billionaire on paper, thanks to the company valuation and a stake of between 10-15% since Oct 2011. Dropbox only had about $200M in revenue in 2013, despite their 2011 Series B valuation of $4B and a Jan 2014 Series C valuation of $10B. $100M — VC financing received by Box in Dec 2013, for a total of $250M funding since launching in 2005. $2B — The company valuation for the Dec 2013 funding. $250M — VC financing received by Dropbox in Jan 2014, on a valuation of $10B, achieved in roughly 7 years. $250M — The amount Dropbox raised in 2011, on a valuation of $4B. $507M — Total funding in Dropbox to date. Box filed in Jan 2014 for an IPO — which could happen in late 2014/ early 2015. $500M is the amount the IPO could bring Box. Dropbox also filed for an IPO around the same time as Box. They’re likely to go public around the same time frame as for Box. 200K business customers and 20M total users as of Feb 2014. As of Oct 2012, they had 140K businesses, including 92% of the Fortune 500, and 14M total users. Nov 2013: 200M users — consumers and small businesses. In Jan 2014, Box started offering a time-limited 50GB of free Cloud storage space to users who upgraded their Apple iOS devices to use a newer version (iOS 7-enabled) of Box’s iOS apps — but gave users one month to react. At the time, Dropbox was still only offering 2GB, with options to get a total of 8GB free by inviting friends or sharing the deal on social media sites, etc. They’ve focused on the Enterprise market since 2007. Dropbox recently went after the corporate market with “Dropbox for Business”, in an attempt to attract medium and large businesses — which has been the domain of Box. Box APIs get 500M calls per month from developers’ Web and mobile apps. 1B — The number of file uploads per day that Dropbox experienced as of late Feb 2013, thanks to the 100M users (as of Nov 2012), using 500M devices — with an expectation of 150M more devices in 2013. Box cofounder Aaron Levie suggests there’s no rivalry, that there’s enough room for several Cloud storage companies. “In late 2011 … Houston was doing battle with Apple Steve Jobs.” Apple later launched iCloud as a competitor to Dropbox. 14,000 developers using Box APIs as of Oct 2012. Box announced in Jun 2013 that they’d pay mobile enterprise app developers that use their APIs based on usage — even for free apps. The payout would be up to 15% of a “Box seat price” (the monthly price per user that a company pays). Dropbox had its first developers conference, DBX 2013, in 2013. Web and mobile developers can now store application data and sync across multiple installs of an app (different devices) — thanks to the Datastores API. 100K — Number of applications integrated into Dropbox, by companies big and small. Box exceeded 400 employees in 2011. Dropbox expanded to 500 employees in 2013, from 200. Both Box and Dropbox are after the Enterprise market, where Box has had a toe in for a while. To get a bigger share of this market, there are some hurdles to overcome, mostly for Dropbox, as Box has been in this market for several years. The perception of Dropbox is of an amateur without the necessary security features that businesses would want. Dropbox for Business, announced in Nov 2013, implemented some of those security features. However, there’s still the task of signing on large enterprises at $175/year per seat licensing. Private Cloud solution. A factor for success for Box or Dropbox is that some companies will want/need a private Cloud storage solution — something already offered by Amazon and other Cloud Computing players — that might serve businesses with 100K employees or more. Loyalty due to legacy. Another hurdle is that if enterprises adopt a solution with a more established Cloud competitor, they’re unlikely to switch over to Dropbox or Box. They’re up against Google Drive, Microsoft OneDrive, Amazon WorkSpaces and others. Loyalty due to value-added. Many of these bigger competitors have other products and services, used by Enterprise, integrated into their Cloud storage offering. Who Has the Advantage: Box or Dropbox? At the moment, Dropbox has more Consumer customers than Box. However, many of these users are non-paying and some will never pay, as they don’t (yet) value their personal data enough. According to Backblaze, another online storage company, only 10% of people back up their computer/ laptop files regularly. On the other hand, Box is more established than Dropbox in the Enterprise market, including serving 90% of the Fortune 500. However, Dropbox has 5 times the market valuation at the moment, and with the resulting funding they received in Jan 2014, have the potential to move ahead of Box for at least new Enterprise and Consumer customers. Also, with Dropbox’s quite large user base of 200+M (Consumer and Small+Medium Business markets), the chances are far greater that non-paying Consumer users that are happy with the service could potentially encourage undecided employers to use Dropbox for Business. Finally, Dropbox has a new “Saver button” feature which Web site owners can implement to allow visitors to upload files (such as free ebooks, images, etc.) to their own Dropbox account. They plan to have a mobile version of this feature in the future. While it’s not enough of an enticement on its own to necessarily attract new customers, this strategy increases brand recognition for Dropbox. There are far too many Cloud storage providers to list them all here, although as mentioned earlier, Box and Dropbox are up against some very establish companies with deep pockets, including Google, Amazon, Apple, IBM, and Microsoft. Microsoft rebranded their SkyDrive product as OneDrive and were offering 7GB free Cloud storage (as of writing), as well an special incentive offer whereby you can get up to 5GB free for referring up to 10 friends (500MB per friend) maximum. An additional 3GB of bonus space is given if you back up your smartphone camera roll using the OneDrive app for iOS, Android or Windows. Early adopters of SkyDrive are grandfathered and get to keep their 25GB of Cloud storage space. Microsoft of course has higher brand recognition than Box or Dropbox. Still, Cloud storage is an immensely large market with multiple sub-niches. Whether Box or Dropbox comes out ahead — or neither do — will depend on how easy they make it both for their intended end users, as well as for developers who want to create custom apps using Cloud storage. For now, Dropbox has the advantage of age, features, funding and consumer user base, and is in the lead in most facets of this cloud storage battle. Box, on the other hand, has the advantage in the business market. While Box has a lower valuation and received less funding than Dropbox, there’s a prevailing sense online that Box will have their IPO first — which could make all the difference.